30 Second Wine Advisor: Half full or half empty? 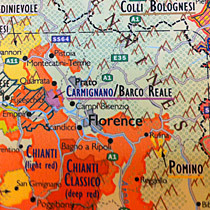 You're bound to find something to love in Steve and Deborah De Long's intriguing collectible, poster-size art wine maps, their useful wine tasting notebooks, and the fun and informative Wine Grape Varietal Table. Click the links above or visit De Long Company online to browse their full collection. Is the bottle half full or is the bottle half empty? This old question is not just a litmus test to separate optimists from pessimists. For wine lovers, it can be an important issue if you're enjoying a delicious bottle with dinner, and now wish to save half of the ration for another day. If you think this seemingly simple matter is as easy as eyeballing a line halfway from the bottle's bottom to its business end, guess again: Bottles come in a variety of sizes and shapes, and particularly if your bottle is a Burgundy-style vessel that narrows from bottom to top, what's actually half of the contents may not appear to come up nearly halfway. Every time I talk about saving part of a bottle, I invariably get a few Emails from humorists who ask, "What exactly is this 'leftover wine' of which you speak?" That's a fair question. The so-called "Thunderbird test" defines an exceptional bottle that's too good not to finish. Still, whether it's for moderation or for price economy, sometimes you really do want to save half of your wine for another meal, or to brown-bag it home from a restaurant under admirable new laws that permit this practice. So, how can you tell when the bottle's half gone? Or, if you prefer, half full? To find out, I donned my Mad Scientist suit, dug up some measuring cups and rulers, and went into laboratory mode. I decanted 375 mililiters of red wine - one-half of a full bottle - and poured it into several empty bottles of differing chapes and punt depths, measuring the half-full level on each. As I had guessed, in a slope-shouldered Burgundy-style bottle, 375 ml of wine filled only 3 7/8 inches, only about 38.5 percent of the 10-inch depth of wine in a full bottle. The same amount of wine in square-shouldered Bordeaux and Chianti bottles came up to 4 1/4 inches, 42.5 percent of their full contents. But let's not fret about extreme precision. Long story short, a half-bottle of wine typically appears to be only about 40 percent full, a variation sufficient to fool the eye into thinking that the bottle is half-finished when in fact you still have a good pour left. If this kind of thing matters to you, or if you simply really want another glass before you poke the cork back in, then get in the habit of eyeballing when your remaining wine approaches the 4-inch mark. I can gauge that pretty closely by gripping the bottle around the bottom with my whole hand, which seems to be about 4 inches from the base of my little finger to the base of my thumb. Using other handy measuring tools, 4 inches is a little less than the height of an iPhone; it's a skosh more than the length of a credit card. Got it? Now you can interrupt your session in the middle of the stream, so to speak, knowing you'll have enough left for a couple of glasses plus a splash on the next day. (I do recommend enjoying leftover wine within a day or two for reds kept at room temperature, or a week or so for whites left in the fridge. I'm not particularly sold on most of the gimmicks sold for wine preservation, vacuum pumps or aerosol gas; in my experience they aren't really more effective than simply putting the cork back in and keeping the wine in a cool place. Here's a Wine Advisor report I wrote about a 2006 experiment in keeping wine: "How long can you keep leftover wine?" The delicious Oyster Bay New Zealand Pinot Noir featured below fits right in with our Wine Focus for August topic in the WineLovers' Discussion Group, "The Wines of New Zealand." We'll spend the month learning more about this lovely land Down Under and its pleasant wines, exploring the Sauvignon Blancs that have made New Zealand famous and its excellent Pinot Noir; but we won't stop there, as there's also much to learn about NZ Riesling, Pinot Gris, even Syrah and a patch or two of Pinotage and more. You're invited to join the conversation about these world-class wines. Bring your tasting notes, comments, questions, and thoughts about everything from food-and-wine pairing to New Zealand travel. All forum discussions are open for public viewing, but you must register to post your comments and participate actively in the conversation. Registration is free and easy; we ask only that you join following our Real Names Real Format system. For your user name, enter your real name in the format "John Doe" or "John D", with the capital letters and the space. FOOD MATCH: Demonstrating Pinot's versatility, on the first day we paired it with spaghetti with a salsa cruda made with chunks of ripe, juicy Italian heirloom tomatoes and fresh basil tossed with green Sicilian olive oil, brought up to meet Pinot Noir with dabs of fresh mozzarella and mild Indiana Capriole Farmstead goat cheese. The second half was fine two days later with thick eggplant "steaks," pan-seared and oven-finished, smothered with mushrooms and onions sauteed in Sicilian olive oil, and with a cheese plate of Capriole. WHEN TO DRINK: Although it's not designed for long-term evolution, its solid balance and protective screw cap will surely hold it for several years under good cellar conditions. VALUE: No complaints about this mid-teens price tag, which Wine-Searcher.com lists as median for this label. That said, check the Wine-Searcher.com link to find many vendors offering it from $12 to the lower teens. WEB LINK: Here's a winery fact sheet on Oyster Bay Pinot Noir, with links to tasting notes and reviews. 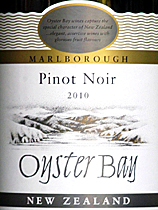 Compare prices and find vendors for Oyster Bay Marlborough Pinot Noir on Wine-Searcher.com.